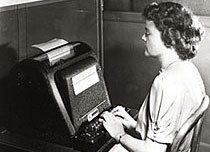 From a teletype console in McNutt Hall on the Dartmouth campus, research mathematician at Bell Laboratories George Stibitz demonstrated the first remote access to a digital computer using standard phone lines. Stibitz's mainframe, an automatic calculator located at Bell Labs' Headquarters in New York, was the first electric digital computer that would evolve into today's modern electronic computer. His was the first computer to perform arithmetic operations in binary fashion, the first placed in routine operation, and the first with either remote or multi-station terminals. The term artificial intelligence (AI) was coined by Dartmouth mathematician John McCarthy. Foundations were laid for AI research during a two-month conference, "Dartmouth Summer Research Project on Artificial Intelligence." 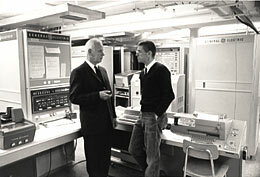 Dartmouth computing began in earnest with the acquisition of a rudimentary LGP-30 computer. 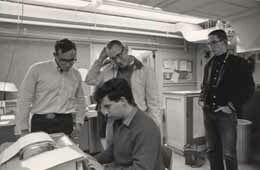 The creativity of "bright undergraduate students adept at computer programming" was first revealed.